The long-range vision for the Music Ministry of Christ Church actually began in 1969 following the church fire. In 1970, a division of “Task Force 6” was charged with the responsibility of developing a new vision for Worship and Music Ministry as a part of the rebuilding of Christ Church. The implementation and completion of these goals over the past 35 years created the Music & Arts Ministry we celebrate today. Augmentation of artistic expressions through the creation of an ‘Artisans Guild.’ Supply needed studios, workshops, and workspaces for art, music, dance, and drama. Development of a Summer Internship in Music Ministry. Christ Church as a Regional Center for Church Music & Worship Arts Education. Create the necessary space (music & arts library, studios, offices, rehearsal space, workshops, etc.) to support this outreach. Sponsor an ongoing series of classes, workshops, summer camps, and recitals related to church music and liturgical arts as related to children, youth, and adults. The Worship Arts at Christ Church are an important and vibrant part of the worship life of the congregation. In addition to music and drama, participants have created stained glass windows, flower displays and altar visuals. They have coordinated art shows and offered liturgical dance. From time to time, the entire congregation is invited to participate in what we call a “communal art project.” These projects are usually to create a piece of art used in worship, and are normally a communion table parament. One of these communal art projects was even featured on the cover of a national worship arts magazine! 1804 – The early music ministry history of Christ Church parallels the trends in colonial America. Wanting to be separate from their counterparts in England, the Methodist Societies in America used a cappella singing as their means of praising God through music instead of pipe organs and robed choirs. Many of the societies met in homes. Camp meetings were the usual place where new songs were learned. Early congregational songs were short and simple. Many were learned by “lining out” the song. That is, a song leader would sing a line and those gathered would sing it back. The circuit riders carried pocket hymnals that were sold to the local societies. This trend continued into the late 19th c. in this part of the United States now called West Virginia. As the society grew, they built their first church home, a log cabin, in 1821. In 1834, the congregation moved into Asbury Chapel, a new, larger building. Asbury Chapel served the congregation until after the Civil War. 1904 – The congregation hired their first “official” choir director, Mr. George E. Thomas, who was paid $10 a week to direct the choir. They also hired their first organist, Mrs. Jennie Gilchrist. The congregation installed their first pipe organ in 1904: Moller Organ, Opus 477 of two manuals, 14 ranks, 21 stops, 799 pipes, tubular pneumatic action (photo above, 1908) Andrew Carnegie helped fund the purchase of the organ. 1908 – The State Street church was sold and property was purchased to build a new, larger church. The members of the congregation moved into the newly constructed YMCA for the next two years. The organ, installed in 1904, was also moved to the YMCA and erected on the stage of the auditorium. The 1904 organ was later sold to Simpson Methodist Episcopal Church. 1910 – The congregation occupies their new church home (photo above.) A new pipe organ by the Hann-Wangerin-Weickhardt company was installed in 1911. The organ was two manuals, 18 ranks, 32 stops, 935 pipes, tubular pneumatic action. The organ was patterned after the organs in the great cathedrals of Europe. A set of Durfee tubular bells was installed in the bell tower and playable from the organ console (as well as manually by a series of pull-down levers.) Unfortunately, this bell system failed to operate in 1937 and fell silent. During this busy time, several people served in the role of organist, director, or both. 1922 – Mr. Charles Greybill (photo, above, 1955) came to Christ Church as a substitute organist, was hired as the regular organist…and stayed for 54 years! In 1933, he assumed the role of both music director and organist. During his tenure as the leader of the Music Ministry, the program grew into one of the largest church music programs in the state. The adult choir regularly performed large-scale choral works. 1944 – An English Bell Amplification System was installed in the bell tower. These bells were actually 45 metal rods which were hung in a case, amplified when struck, and broadcast over speakers located in the bell tower. This system was purchased in honor of the women and men of the church who served in World War II. 1955 – The Hann-Wangerin-Weickhardt organ was rebuilt and enlarged by the Hillgreen & Lane organ company (photo above, 1958.) The new organ was electrified and enlarged to 3 manuals, 33 ranks, 41 stops, 1903 pipes. The original facade remained. 1969 – The sanctuary was destroyed by fire. Architect Ed Sovik was hired to rebuild the church. The structure was rebuilt in his signature style and reoccupied in 1973. 1976 – The congregation purchases its first 4 octave set of Schulmerich handbells. 1977 – The Verdin Bell Company of Cincinnati, OH, reactivate the Durfee Tubular Bells located in the gothic bell tower, which survived the 1969 fire. 1979 – The congregation purchased a Hubbard harpsichord kit, which was then assembled by Charleston resident Robert Myerly. The harpsichord was patterened after the renowned instruments built by Pascal Taskin. At the same time, a 5 recorder consort was also donated to the church. 1981 – The congregation purchased the 5th octave of Schulmerich handbells. 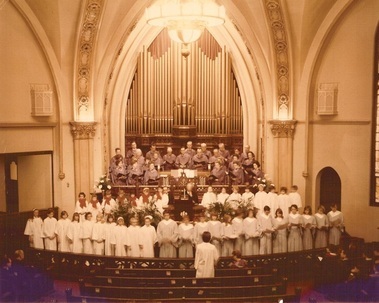 1985 – In celebration of the 10th anniversary of the Holtkamp Organ, Peter started a program of “mini” recitals, which were held on the third Sunday of the month immediately after the 11:00 morning worship service. In 1987, Peter placed second in the American Guild of Organist Young Artists Competition. 1986 – The music ministry presented their first version of the Lessons and Carols Service patterned after the traditional service held on Christmas Eve in King’s College Chapel, Cambridge, England. 1991 – The congregation, led by the Worship & Arts Committee, presents their first Boar’s Head and Yule Log Festival. 1993-1994 – The Chancel Choir makes their first professional recording and takes their first trip to England. Also, David released his first book through Abingdon Press, entitled How Does Your Choir Grow. 1997 – An Estey Pipe organ from 1904, which was donated to the church, was renovated and installed in the chapel replacing an electronic instrument. The organ is 2 manuals, 9 ranks, 14 stops, tubular pneumatic action. 1998 & 2004 – The Chancel Choir makes additional trips to England and Scotland. The Chancel Choir and Chancel Ringers make their second professional recording in 1998. In 2004, the congregation celebrates its bicentennial, and the music ministry celebrates its centennial! 2005 – The congregation reacquired the 1904 Moller Organ, their first pipe organ, after it was offered for sale by Simpson United Methodist Church, who purchased it in 1914. Current plans are to use the pipes from this historic organ and install them in an antiphonal organ to be built in the Centrum by the Holtkamp Organ Company. 2006 – A book, Some Action Ought To Be Taken, is released by the church. The book, written by David Donathan, is a 200 year history of the music ministry. Information for this webpage was extracted from this book. 2007 – The Worship & Arts Committee, with the blessing of the Board of Trustees, signed a contract with the Holtkamp Organ Company of Cleveland, Ohio, for the initial design of the proposed antiphonal organ using the organ pipes acquired in 2005. The computer rendering of this instrument and its proposed specifications can be found on The Pipe Organs of Christ Church web page. The Way! (Worship Arts for Youth) was created as a new ministry for youth 6th-12th grade. * Proposed addition mounted high in the organ but playable from the positive manual. The Holtkamp Organ was installed in the Centrum of Christ Church during the summer of 1975. Formal dedication was held on Sunday, October 12, 1975 with Donald Sutherland and Phyllis Bryn-Julson presenting the dedicatory recital. This mechanical action instrument is spread over three manuals and pedals and is considered to be in the “American Classic” design. Acoustical renovations to the Centrum of Christ Church in 1996 greatly enhanced the sound of the organ. In 1903, the ancestors of this congregation purchased their first pipe organ, Moller Organ; Opus 477 (pictured above, 1908). The organ was installed in the State Street Methodist Episcopal Church in February, 1904. Andrew Carnegie donated $600 toward the purchase of this organ. In 1908 when property was purchased to build a larger church, the congregation met from 1908-1910 at the YMCA. The organ was moved to the stage of the auditorium at the YMCA and used in that location for 2 years until the congregation moved into their new church home. When the congregation occupied their new church home at the corner of Quarrier and Morris Streets, the 1903 Moller Organ was sold and moved to Simpson Methodist Episcopal Church (now known as Simpson Memorial United Methodist Church, photo above 1945.) In 1965 the organ was electrified and enlarged. In 2005, the Trustees of Simpson were discussing the fate of the organ since it had fallen into disrepair and was in need of renovations totalling $50K. After months of debate, Simpson decided to sell the organ back to us. The original Moller sales contract from 1903 containing the original stoplist was found in the Christ Church archives. Upon further investigation of the organ, we found that 12 of the original 14 ranks of pipes from the original 1903 organ survived the 1965 rebuild and were still intact. Thanks to an anonymous donor, Christ Church purchased these 12 ranks of historic pipes associated with the original 1903 organ and were placed in storage at Christ Church. In January, 2006, Chris Hotkamp of the Holtkamp Organ Company (the builders of the Centrum Organ) came to Christ Church and inspected the 1904 pipework and found them to be in excellent condition. The preliminary plans call for the creation and installation of an antiphonal organ (not just an antiphonal division, but a full organ) using these 12 ranks of pipes. The current Holtkamp Organ console would be updated and enlarged in order to play both instruments from one location. After the necessary updates, the current organ would remain a mechanical action instrument, but electro-pneumatic action would be used in the antiphonal organ. In January 2007, the church signed a contract with the Holtkamp Organ Company of Cleveland, OH for the design of the antiphonal organ. The antiphonal organ case will compliment the case of the current Centrum Organ. At the signing of the contract, an organ committee was established to review the design of the antiphonal organ/additions to the current organ before presentation to the congregation. The preliminary designs were approved on Monday, April 23 and presented at the 2nd Annual Music Ministries Jubilee Dinner on May 16, 2007. Funds for the design were given by an anonymous donor. During the winter of 2010, the plans for the antiphonal organ were finalized and await approval of the organ committee. Once approved, funding options will be discussed. This organ once graced the stage of Carnegie Hall in Lewisburg, WV. Purchased in 1904 with funds donated by Andrew Carnegie, the organ was donated to Christ Church in 1996. After extensive renovations, which maintained the original pneumatic brass tubes, the organ was installed in the Chapel of Christ Church in 1997. (The photo, above, was taken before the hardwood flooring was installed.) The organ was dedicated on Sunday, October 19, 1997 by Director of Music Ministries/Organist David Donathan and members of the West Virginia Symphony. This pen drawing was created by Aaron Crothers. It shows the three pipe organs this congregation of Christ Church has used over the years. The organ on the bottom, left is the Moller Pipe Organ, Opus 477 from the State Street Church. The organ in the upper right is the Hann-Wangerin-Weickhardt Pipe organ installed in 1911 and updated and enlarged by the Hillgreen & Lane Organ Company in 1958, destroyed by fire in 1969. The organ in the center is the current Holtkamp pipe organ located in the Centrum. For information about leasing space at Christ Church, please contact the church office at 304.342.0192.